Rumored since early last year, the first-ever WWE DVD on AJ Styles is now official! “AJ Styles: Most Phenomenal Matches” is next to join the 2018 WWE Home Video schedule with a release date of November 6th to fans in the United States, expected to hit the United Kingdom the very same week. A new product page for the AJ DVD has been created here on Amazon.com. The Amazon page contains a brief synopsis for the title but WrestlingDVDNetwork.com is bringing you a more detailed synopsis and exclusive first word on five matches that are already confirmed! Since joining WWE in 2016, AJ Styles has truly become “The Face That Runs the Place” on SmackDown Live, impressing audiences with unbelievable athleticism and undeniable fortitude. For the first time ever, WWE Home Video collects AJ Styles’ most phenomenal matchups from his first two years in WWE featuring unforgettable bouts with John Cena, Chris Jericho, Shane McMahon, Kevin Owens and more! The new AJ Styles project was originally speculated to be a documentary-led release however it soon became clear that the format will instead be a match compilation (hence the name “AJ Styles: Most Phenomenal Matches”). 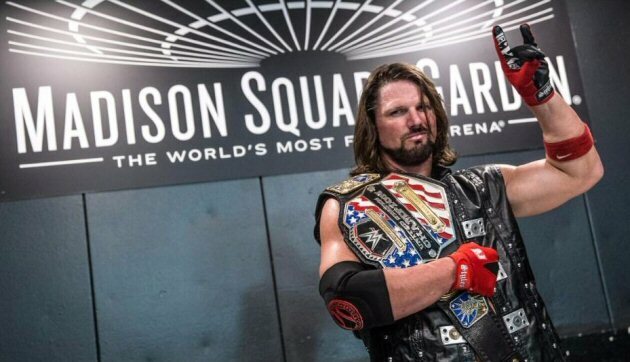 One such match reported as in the works for this DVD since way back in July 2017 was an “unseen” AJ Styles match from Madison Square Garden in which he fought Kevin Owens for the United States Championship and unexpectedly won the gold in a rare non-televised moment. The match is likely being included here but isn’t quite confirmed yet – but we do have a list of a handful that are! The first bouts to make the 3-disc set are all three WrestleMania matches AJ Styles has competed in to date and both of his WWE Championship victories. – UK/Europe: November 5th. Pre-order the new AJ Styles DVD very soon on Amazon.co.uk. – United States: November 6th. Pre-order the new AJ Styles DVD here on Amazon.com. – Australia: TBA. Look out for your chance to order the AJ Styles DVD at Madman.com.au. 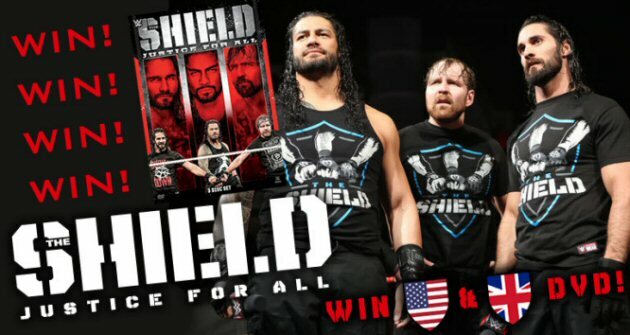 WWE’s brand new “The Shield – Justice For All” DVD released to stores this week and here at WrestlingDVDNetwork.com we’re already giving two copies of it away absolutely FREE! We want to hear your favorite match or moment that involves one or more Shield members. Put it in a comment and you might just win the 3-disc set. We have a US and a UK version up for grabs. It’s the last day to enter the giveaway – two winners will be selected at random tomorrow. 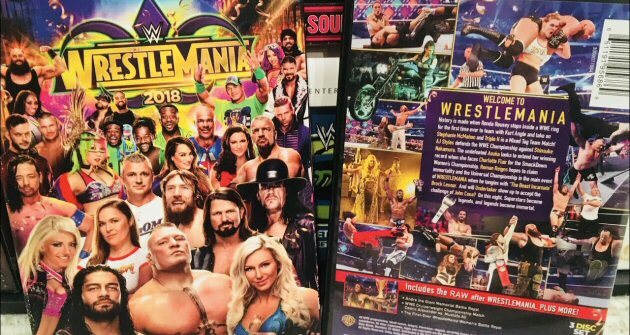 A couple of months back the WrestleMania 34 DVD hit the United States and unannounced before hand the DVD released with the promise of a “Digital Bonus” of the 2018 WWE Hall of Fame, which wasn’t present on the discs due to the lengthy runtimes of ‘Mania and the HOF ceremony. 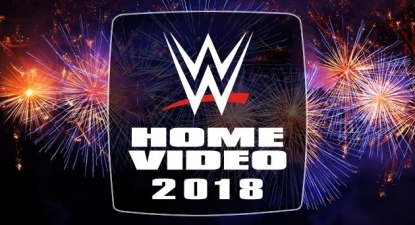 Unfortunately WWE DVD collectors who purchased the DVD were unable to redeem this bonus, however WDN reader “wrestlefanatic77” has informed us that as of this week Warner Brothers Digital have fixed the issue and the ceremony can now be unlocked. It is found uploaded to Moviesanywhere.com. If you have a VUDU account, you can simply sign in and find the Hall of Fame now listed under the WrestleMania 34 page in an “Extras” section. 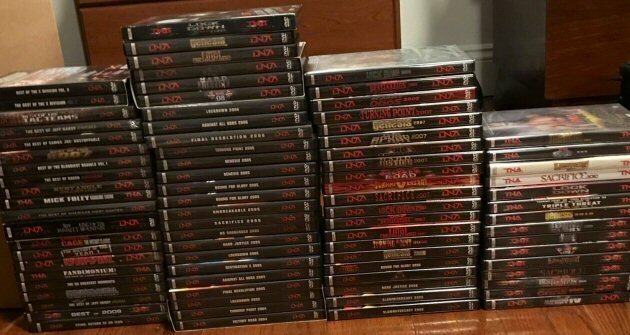 EBAY WATCH: WDN reader Jeff Evans wants to let you know that he’s eBay’ing a massive collection of 84 TNA Wrestling DVDs here on eBay.com. He’s open to offers on the lot. I might give this a pass. Well I bought the “Women’s Evolution” ” DVD and the first disc’s is so scratched up from being stacked ontop the other two that it only plays to the Victoria cage match and will not play any longer. So frustrated with this cheap Warner Bros. packaging. And of course I can’t find the receipt to return it for a replacement. Now who says stacking disc’s is not a problem? Well I can’t speak for the issue you’ve had; all I’ve ever said is stacked packaging has never resulted in a damaged disc for me personally. If it ever happens to me then obviously it would change my opinion, but right now I can’t be sure that it didn’t happen because of the way you were handling the discs. Only you know what actually happened. Well, I took the disc out of the box and put it into my BR player. It’s not like I used a chainsaw to remove the disc. I had the same problem with others as well and if this was the first I would not be complaining so much. I understand this is the way it is going to be from now on because of media sales, but it doesn’t mean we have to be happy with it and as time goes on I am sure people like me will complain less and less but they continue to cheapen the product we all love and until that plateaus, there will be complaining. Hopefully this has a few of his WCW matches and the WWE matches from 2002, and maybe just maybe some of the XWF matches since they had one on the Hogan DVD from 2006, but who knows if that’s possible still today. I think they would just have to square it with Jimmy Hart as I believe he owns the footage. Hopefully he’s still on good terms with them. They certainly weren’t “phenomenal matches though”, so maybe they should only include one XWF match at best. I don’t see them including more than one WCW and early WWE match each either, as the precious space will be needed for as many WWE matches as possible, which for the most part have been awesome. I’m hoping for the Brock match as it didn’t make the Best PPV Matches set and I don’t buy individual PPV DVDs apart from ‘Mania and the Rumble. Well this is a must buy for me due to the Backlash 2016 main event finally being released, but I would’ve liked a documentary. However, if they’re holding back on a doc because they want to tell a more complete career story in the future, then that’s fine by me. That was the only issue with the Kevin Owens documentary; great doc, but just too soon. 3. Comments from them and some of the other important individuals from throughout their careers. 4. The docs were done AFTER they had retired and were inducted into the WWE HOF. If I’m not mistaken I think their inductions were even part of the content or special/extra features section of the respective sets. Doing docs on whoever after they’re retired should be imo a regular and both aforementioned above docs are definitive proof why. Not yet retired is why I believe Kane & Taker haven’t gotten docs yet. God knows both deserve one as do their fans myself included. With them being at the end and close to retiring best at this point to wait till they’re finished, then release the doc sets on them. However Unreleased sets on both can be released before that. That match might be on here but could also be saved for – if/when there is one released – an AJ documentary set. You don’t wanna release the same match on multiple sets. My favorite moment is their Survivor Series debut. I was there live, in Indianapolis. Another lazy releasen with no documentary of HD footage put in DVD format. It’s asinine in 2018 we have to deal with DVD quality. It truly is. Pay a premium price for less quality than available on The Network. For really marketable ideas, like a collection of AJ Styles matches that were all filmed in HD, there is definite interest there. I understand not doing old stuff in BR format anymore, but for things like this and that Seth Rollins release? Come on! EVERY article just descends into it. This is why I very rarely frequent the site anymore. To be frank, the site has just become boring. EVERY article comment section just descends into it. If that is why you’re bored here then don’t scroll into the comments. And if you’re bored on one of our exclusives about an AJ Styles DVD, well, we aint got much more for you. Do you deny the amount of times this BluRay ar2gument is regugitated though, Daniel? I get what you’re saying, but surely you must conceed we make a valid point in our own right. Most of the time discussion about content or released schedules or the excitement for upcoming releases etc. is getting completely pushed out the way for arguments about HD vs. standard def. quality, when WWE have made it quite clear how they feel about producing BluRays, so the argument is just futile at this point. I just wish the focus could be on what we are getting a little more, rather than what we’re not. Yes, “comments section” … fairly obvious that’s what I meant I would’ve thought, since an article wouldn’t “descend” into anything. Bit pedantic there. Plus, the comments section doesn’t have a name, does it? The site does. I’m pretty sure Roly was referring to the comments and not taking a pop at your article, given that the context of their reply was around my comment re: the BluRay debate. All respect to you and the site staff Daniel, but you know, I’d be remiss not to defend myself on a couple of points there. There really is no debate. I’ve yet to hear anyone on the other side of the argument say that DVD’s are better in any way. The reason they’re better for me is that they’re cheaper and I like to have more money in my pocket, since I have a wife, a child and other interests outside of watching wrestling. Cheaper doesn’t always equal better. That’s a personal decision. I know LP1; I was making a joke that they were “better” because they were cheaper. Obviously I didn’t mean it was a superior product. DVDs are inferior in comparison with blu-ray in terms of picture quality/audio and even packaging. No argument can be made for rather buying a DVD over an equivalent blu-ray that makes sense or would stand up to scrutiny. Philip, they make portable blu-ray players also. Been making them for years. Good point LP1! That was my first thought when I read Phil’s retort. And yet some people would argue that no argument could be made for buying a BluRay over digital streaming in HD, and would call you a dinosaur for still purchasing physical media. My point is, respect other people’s choices instead of acting like everything should be done your way. Incorrect. Not everyone has the internet capabilities in their area to stream HD videos. There’s a lot of rural places where upload/download speeds aren’t as fast as they are in more populated areas. So buying blu-rays in their case is still the best option for watching and owning HD videos. You can still just respect people’s choices as to what they wish to purchase with their own money. Umm, yes I do. But that’s not what this conversation is about. It’s about which format is better. I never said anything about how people should spend their money. One person said he buys DVDs because of portable DVD players. All I did was let him know that portable blu-ray players exist as well because he seemed to be unaware of that. It’s asinine that people use a site like this to complain about quality. You don’t like dvd quality in 2018. Fine. I don’t either. But I’ve accepted that it is what it is, have dealt w/it and moved on. Suggest u do too. In 2018 there’s seriously far more important things going on in the wtthan what’s released and in what format/quality. Personally as much as I don’t like dvd quality I rather have that than the respective content not be released at all. If u really want superior quality over dvd get the Network for only $9.99 and enjoy everything they have to offer there in better than dvd quality. Yeah, it’s way too early to put out a WWE documentary on AJ Styles. Although, if they can get all of his TNA footage, then by all means, do the documentary. Hopefully when/if that is possible, they will make a proper documentary on Sting as the one they most recently released seemed like something they would have just put on the network and didn’t put a lot of time into it like they did with Paul Heyman’s documentary, for example. Yet another release, in a thick box that would be more suitable for a VHS-tape, coming up, to fill up twice the size of a Blu-ray, with great content that looks like shyt on media not suitable for HD-filmed material. Performer and most matches – Phenomenal? Check! Format of release – Phenomenal? That’s a big huge Uncheck, WWE! All thanks to cheap people who bought DVD versions over Blu-ray for many years. What is it with you and the “VHS tape” comparison every time a release is announced? If you care so much about being technologically up to date why do you even have physical media? The point is that you own it. Lol yeah, if cared that much about being current, you’d think he’d have moved completely on to streaming in HD. actually if I’m not mistaken the WWE Network is streaming at 720p. so physical media (in terms of bd) would provide both a higher bitrate and resolution. True. But the WWE Network can hold more content on it than any disc space will allow and since their bluray sets were usually if not always only 2 discs that’s not a lot of content compared to everything The Network currently has on it. And The Network can be viewed from any device while discs need compatible players to watch it. In a way people get more content and better than dvd quality for less $ w/The Network in the long run. WWE Blu-rays are 1080i and WWE DVDs are HD downscaled to 480p (LOL! )….which is basically a notch about VHS quality. If the July 7, 2017 match is included I’m getting this for sure. I was ringside for that. Hopefully they include other matches you can’t catch on the network. What’s the July 7 match you’re talking about?? And what other matches that you can’t catch on the Network? I guess you mean live/non televised matches here?? ?